In 2007 after months of excruciating back pain, Sue Arnold made an appointment with OrthoIndy’s Dr. Michael Coscia, an orthopedic spine surgeon. Dr. Coscia informed Sue that she had degenerative scoliosis and spinal stenosis, and he recommended back surgery as a good option to relieve her back pain. Degenerative scoliosis is a condition that refers to an abnormal curvature of the spine, and it develops as joints in the spine degenerate, which causes the spine to bend. Sue’s other condition, spinal stenosis, is a narrowing of the open spaces within your spine, which puts pressure on your spinal cord and the nerves that travel through the spine to your arms and legs. Sue was uneasy when Dr. Coscia told her that she would need a hemilaminectomy and a foramenotomy on her L4 and L5 disk in her spine. Sue was very hesitant about having back surgery because of her passion for gardening. While she had been in extreme pain in the past, she always seemed to push through and tend to her gardens. A hemilaminectomy is a highly invasive spine surgery that removes part of the vertebra called a lamina. Each vertebra in your spine holds two laminae, which are bony segments that form the rear of the vertebral arch and serve as a base for the vertebra. Setting her nerves aside, Sue decided to go ahead with the back surgery, and things couldn’t have gone better. Dr. Coscia was extremely proud of Sue for how well she did. Back surgery has allowed Sue to continue doing the things she loves, like gardening, without pain. Fast forward to 2012. That year, Sue was in a very bad car accident. Her car was t-boned, and it flipped upside down. Somehow Sue walked away with only a spiral fracture in her right hand. Since she had such a positive experience with her OrthoIndy back surgery, Sue returned to get her hand checked out. With OrthoIndy’s care, she was able to heal her hand using just a splint. In May 2015, after a few years of happily caring for her gardens and doing work around her house, Sue found herself at OrthoIndy once again. She was working outside and catapulted herself off of a ladder. She was extremely confident that she simply fractured her tibia. She came to OrthoIndy to visit Dr. Bruce Rougraff, who specializes in bone tumor and soft tissue oncology. Dr. Rougraff diagnosed and treated Sue with an immobilizer for six weeks. Though she lost a lot of strength and mobility in her leg from the six weeks she was immobilized, Sue has been able to go out and continue her social life. She coordinates volunteers in her herb garden at the White River Gardens, gardens on her own at home, travels to many different countries and exercises. After several tries of the spinal injections and not much pain relief, Dr. Langhorst ordered an electromyography. An electromyography, often referred to as an EMG, is a diagnostic procedure that assesses the health of muscles and the nerve cells that control them. Sue then tried physical therapy with OrthoIndy to relieve her back pain. “Therapy was very helpful and I learned the proper way to walk, sit, etc.” Sue is thrilled with the results she has seen through physical therapy and has regular follow-up appointments with Dr. Langhorst. Sue is now back at work, but with some limitations. She’s back tending to her gardens and started taking Pilates classes. Sue was even able to travel to Lithuania and Russia this past summer. She is thankful for every single physician she has worked with at OrthoIndy. You don’t have to live with back pain. 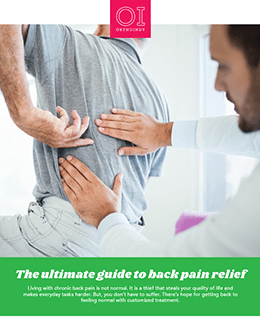 Learn more about how to get relief with our ultimate guide to back pain relief. Find out what's causing your back pain and how you can treat it with OrthoIndy's ultimate guide to healing back pain. Shelby was the Marketing Intern for OrthoIndy during Summer 2016. During her internship, Shelby wrote a variety of articles and blog posts, as well as aided in social media and media relations tactics for OrthoIndy. Shelby is a senior at Ball State University and will graduate in May 2017 with a bachelor’s degree in public relations.